This is an X-ray of my spine one year ago, when I moved my life from New York City to Marietta, Georgia to begin Chiropractic school at Life University. I have had scoliosis my entire life and have been under chiropractic care since high school. My spine has now begun to straighten out at the age of twenty-four. “How?” you ask. With the combination of Specific Chiropractic and Powerlifting. The bones are properly aligned and the stabilizing muscles are strengthened to hold the bones in the correct position. It is really that simple. You can’t build a house on a fragile or crooked foundation, so why build your body on top of a misaligned spine? Many of you reading this probably have some understanding of chiropractic otherwise you wouldn’t get adjusted regularly, but are you aware of the fundamental chiropractic philosophy? You probably have been to a chiropractor at least once or many times for common aches and pains, maybe even major problems, and if so, that’s great! You are already one step ahead of those people that go to a medical doctor for prescriptions to rid them of symptoms. “Rid them of symptoms” is the key phrase here. Prescription drugs do not rid the body of the cause of a disease. If you are “sick” or have symptoms, that actually means your body is healthy and doing its job. Adding drugs to this equation suppresses the symptoms, and the body’s ability to fight the disease (or whatever problem is causing the symptoms). What I am saying here is that the body heals itself. This is the philosophy of chiropractic. Still you may say, “Ok, I don’t need drugs, but my back hurts, so I need to go to my chiropractor.” This was also my mentality for a very long time. I am even getting away from full spine chiropractic and treating symptoms all together. Even some chiropractors try to treat symptoms. They adjust a hip when it hurts, a knee when it creaks, or your lower back when it’s achey. My chiropractor adjusts my atlas when it’s pressing on the brain stem, and only when it’s pressing on the brain stem! This is Specific Chiropractic. Specific Chiropractic (a.k.a. Upper Cervical Care) is a safe, precise form of chiropractic which focuses on the health and function of the brain stem. The brain stem connects your brain to the rest of your body allowing normal, healthy messages to be communicated–it is literally your lifeline. Irritation or damage to the brain stem can disrupt this communication and cause you to develop sickness and pain. An Upper Cervical Doctor uses precision equipment and specific adjustments to restore proper brain stem function and reestablish communication between the brain and body. When communication is restored, you can recover from any current sickness or pain and prevent future illnesses. 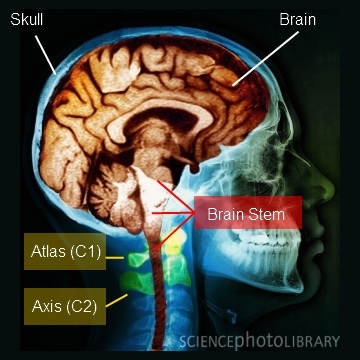 Because of both its critical role as your lifeline and its delicate structure, your brain stem is well protected between three bones: the skull, Atlas (C1), and Axis (C2). This area of the body is referred to as the upper cervical spine. Alignment of these bones is critical and allows the brain stem to function normally. If one of the upper cervical vertebrae–Atlas or Axis–becomes misaligned irritation or damage to the brain stem occurs. This dangerous type of Central Nervous System condition is called a Subluxation. Communcation between the brain and the rest of the body is distorted or lost and, if left uncorrected, causes your body to develop symptoms like pain, sickness, and ultimately disease. This may be why you and your family haven’t been well. Is it hard to believe that I went to a chiropractor once a week for an entire year and only got adjusted three times?! You’d probably stop going if you felt like you weren’t leaving satisfied, and trust me, there were days I just wanted to get “cracked!” But what would an adjustment do if I didn’t need one? It would probably re-subluxate me, then we’d be back to square one. Yes, there is still a curve, but it has improved immensely. So much so, that I felt it important to share with you. 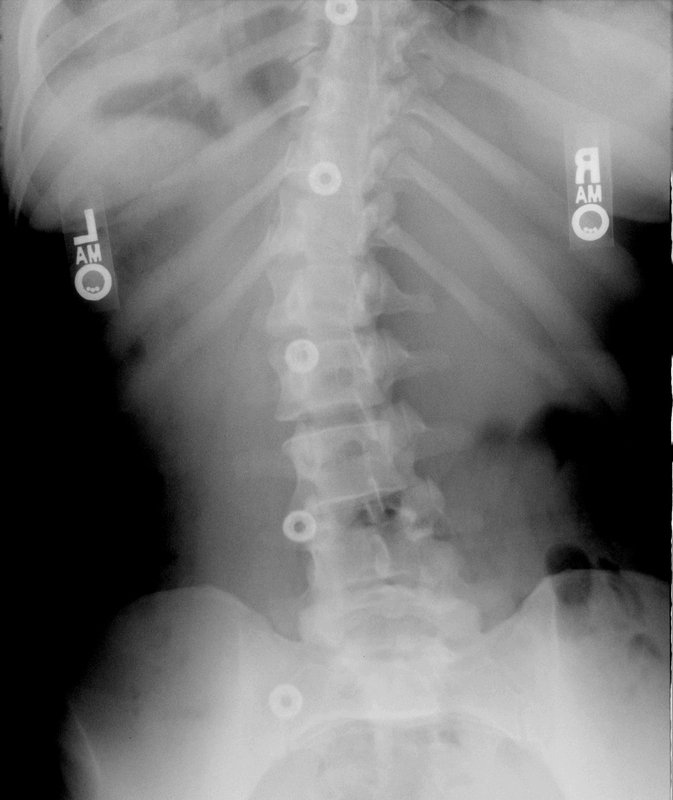 When I took a deep breath and held it for this X-ray, I actually thought to myself, doubtfully, “How much change could have taken place over the course of a year in a spine that hasn’t changed or been growing for a decade?” Well, luckily, to my surprise, a whole lot! 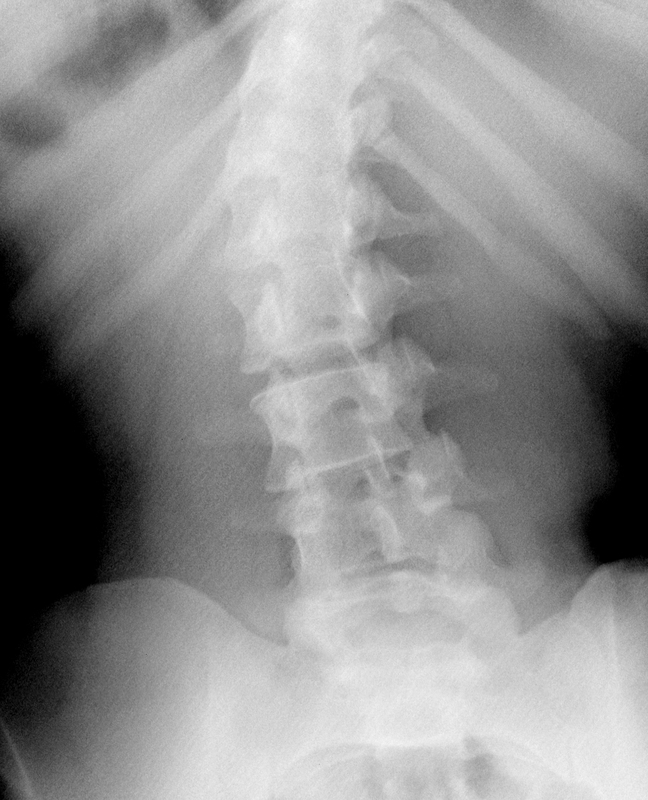 Here you can see the ribs are no longer as rotated, and give my spine much more mobility. My pelvis is more level, and the lumbar vertebras do not begin to curve until much higher. Get out your x-ray pencils to get more precise measurements. And remember, this is only from three adjustments to my C1 and C2 over the course of one year. So where does powerlifting play a roll in this? Well, as many of you know, before I lifted weights, I was a classically trained dancer my entire life. My body was already well conditioned and relatively strong, compared to the average person, but it was not STRONG enough! The first day I tested my maxes I squatted 215, benched 115, and deadlifted 280, untrained. People said powerlifting was dangerous for a person with scoliosis. Even many chiropractors said that axial loading my spine was a bad idea. So I did my research on this, because I simply could not believe that lifting heavy was bad for me. I found many things that supported what doctors and weaklings were telling me… (but who reads Women’s Health anyway?). As for dancing – that was out. Unilateral, asymmetrical, external rotation, was constant wear and tear I did not need or want anymore in my life for the sake of being well. 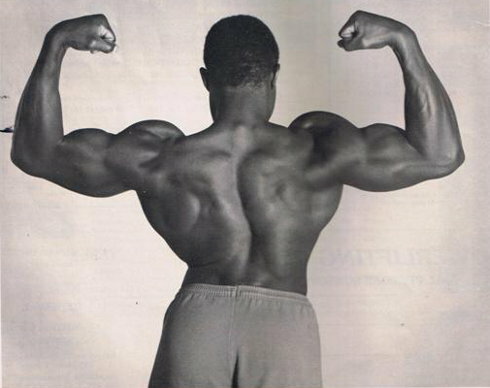 Lamar Gant (born 1957) is an American world record-holding powerlifter with idiopathic scoliosis. He was inducted into the International Powerlifting Federation Hall of Fame in 1980. Gant set his first world record in 1974 by deadlifting 524.5 pounds (238 kg) at a bodyweight of 123 pounds (56 kg) at the Flint Olympian Games. In 1985, he became the first man to deadlift five times his own bodyweight, lifting 661 pounds (300 kg) at a bodyweight of 132 pounds (60 kg). For this, he has been included in the Guinness Book of Records. As of 2006, he holds the world records for deadlifting in both the 123- and 132-pound weight classes. His best lifts at 123 pounds are 314 pounds (142 kg) RAW bench press and 638 pounds (289 kg) deadlift; at 132 pounds are 595 pounds (270 kg) squat 615 pounds (279 kg) (in training), 352.5 pounds (159.9 kg) RAW bench press, and 688 pounds (312 kg) deadlift. You can read the article “He Bends but Does Not Break” in the Sports Illustrated Vault. I understand that the sport of powerlifting may not be for everyone, but strength training for the sake of having a strong healthy spine should not just be for powerlifters, strongmen, olympic lifters, etc. When I get out of chiropractic school, I fully intend on designing my practice around the health of the whole body, but the foundation of wellness is simply this… Clear the nerve interference & strengthen the muscles that support the spine. Our bodies are amazingly wired structures that have an innate purpose to survive, but subluxations and muscles usually don’t correct and strengthen themselves.